an easy task in the crowded and competitive Canadian investment market. • Make Stock Pickers Digest stand out. • Motivate prospects to subscribe. • Build on the newsletter publisher’s personality and credibility by featuring his photo, biography and successful track record. • Include testimonials of satisfied subscribers. • Create the website exclusively for prospects—not current subscribers. • Use persuasive direct response copy to highlight the newsletter’s unique benefits. • Use a type font and size that are easy for seniors to read. • Include no navigation options except “subscribe now” to avoid losing readers. • Make the offer clear and compelling, and include a special quick-order bonus. • Reinforce copy benefits, premiums and guarantees in the shopping cart area. • Streamline the ordering process by not requiring too many clicks. • Include several options for subscribing, such as an 800 number, mail, fax, etc. new subscriptions despite the tough, skeptical market. 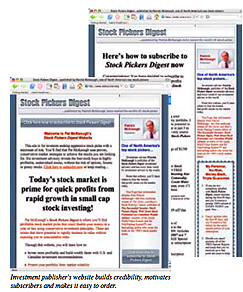 To view the Stock Pickers Digest marketing site, please visit www.stockpickersdigest.com.